Stop striving for perfection... whether it's in your relationships, your business, or some other area of your life. 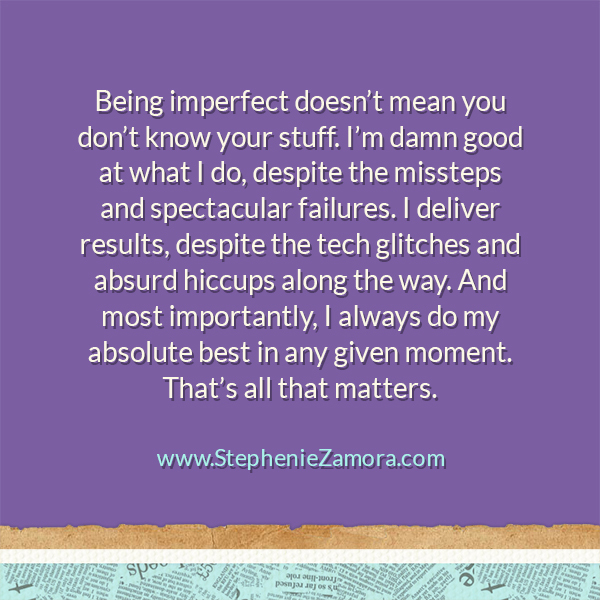 Embrace the imperfections and the quirks. Laugh at the failures as they explode brilliantly around you. "I love your transparency," she said as she laughed along with me at the absurdity of the technical glitches I'd encountered trying to run my first group Acupressure session. It was pretty funny actually... considering that at one point, I was carefully sliding my hand off camera to grab my purse and fish out my credit card as I watched the "your trial meeting is about to end" timer count down. I have to admit, I played it super cool. Like, no one had any idea that we were 34 seconds away from being completely disconnected before I was able to get the website to finally register my payment, all while I was leading people through some deeply focused energy work. High fives all around, right? While I may have played it super cool during the whole ridiculousness, I didn't act like nothing happened. I also didn't lose my cool and flip out on the service provider. I laughed, a bunch. Ate some ice cream. Then told everyone about it so they could laugh with me. Because, seriously, how does that happen? I'm nothing if not real with my clients. Because it's important everyone remembers I'm human. Which means, I'm going to let you down. I'm going to mess up, spectacularly at times. I'm going to fall short or miss the mark completely every now and then. I'm going to forget. I'm going to get taken out at the knees by life and knocked around a bit. And, apparently, I'm also going to miss whatever ridiculously small print informed me that my account was a trial account, and I'm going to nearly get dropped in the middle of a live group session as I fumble around for my credit card. I'm human, which by definition means I'm imperfect. To be clear, I don't say this to give myself a pass for letting people down. I strive to always deliver on time and above expectations. I strive to have my programs run seamlessly and without hiccups. I believe in keeping my word and giving my best. But I'll still mess up, and I'm not afraid to admit that to the people who pay me money to tell them how to run a successful business. Turns out they're human too. And acting like I have everything together 100% of the time is only going to stress me out, and set an impossible standard for them... one they're never going to be able to reach. Because it's not possible to be perfect all the time. I've worked behind the scenes with hundreds of clients over the years. Big name clients with flashy websites and enormous mailing lists. I've built their membership sites and sales pages and walked through their launches with them. I'm sorry to say that about 90% of those people straight up lost their mind over the tiniest, most insignificant details being out of place. When the technology failed, as it does, they turned into these awful launchzillas with nary a kind word in sight... only to go and put on a happy, shiny, "everything is so amazingly wonderful all the time in my world" front to their audience. I refuse to do that. When I first started out, I bought into the idea that I was supposed to be perfect all the time. It was stressful, and I felt like I couldn't really show up fully as myself. I couldn't teach certain things until I was far through or beyond them, because god forbid my list know that sometimes I struggle too. I'm sure that some people don't hire me because of this... and that's okay. They're not ready to admit that perfection isn't attainable, and that it's okay to be human, inside and out of our businesses. But the ones who do? They love it, and they tell me all the time. They appreciate that I'm real and transparent. They stood by my side when my whole world flipped upside down after grief broke me clean in two. When I couldn't be anything close to perfect, because I was too deeply shattered to function how I did before. Mostly, they're relieved to know they're not alone. Being imperfect doesn't mean you don't know your stuff. I'm damn good at what I do, despite the missteps and spectacular failures. I deliver results, despite the tech glitches and absurd hiccups along the way. And most importantly, I always do my absolute best in any given moment. That's all that matters. Stop striving for perfection... whether it's in your relationships, your business, or some other area of your life. Embrace the imperfections and the quirks. Laugh at the failures as they explode brilliantly around you. Shed a tear if you must, but keep breathing through the disappointments and frustrations. And if you really want to be of service to others... be honest and transparent about what it really means to do the work you do, have the life you have, and be in the amazing relationship you're in. I promise you'll build a stronger audience that trusts you deeply. Stephenie Zamora is the founder of www.stepheniezamora.com, a full-service, life-purpose development, design and branding boutique and author of Awesome Life Tips book. Through her Mastery program, she merges the worlds of personal development and branding to help men and women build passion-based lives and businesses they love. Click here to access her free Foundations for Unshakable Joy™ video training series and learn the unexpected trick to transforming your life with one single question! Connect with Stephenie on Instagram, Facebook and Twitter!